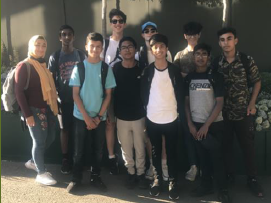 On the opening day of the Wimbledon Tennis Championships 2018, 10 students in Years 9 and 10 were rewarded for their efforts and leadership in tennis this year with a visit to Wimbledon. It was a tough decision but Miss Wright and Miss Prest decided to come along in the end too. 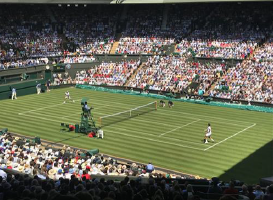 First up was the men's defending champion Roger Federer on Centre Court. Showing his class, the eight times Wimbledon champion won in straight sets against Serbian Dusan Lajovic. Throughout the day students enjoyed testing their own skills on the courts and soaking up the unique atmosphere as they explored the grounds. Last up on Court One was six times Wimbledon champion Serena Williams, having last won the tournament in her last appearance here in 2016. Her opponent Arantxa Rus of the Netherlands put in a strong display in the first set, but Serena showed her strength and desire to win and outwitted her opponent in two straight sets.